POISONED SYSTEM: Mark Schapiro says laws in this country are no longer protecting us from toxic chemicals, and Silicon Valley engineers are looking to the European Union for solutions. MARK SCHAPIRO works at the Center for Investigative Reporting. 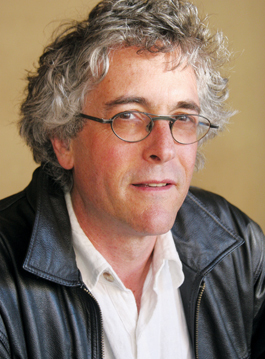 His work has appeared in Mother Jones and The New York Times Magazine, and he is a regular guest on NPR. He spoke with Metro about his new book, Exposed: The Toxic Chemistry of Everyday Products and What's at Stake for American Power. Metro: Most of us assume that if it's sold in a store, it's OK. You say otherwise. Mark Schapiro: Americans operate under the assumption that some governmental authority out there is assessing whether the products we encounter on a daily basis are safe. I'm sorry to report that's not the case. We're confronted daily with hundreds of different chemicals that are in everything from cosmetics to electronics to children's toys to automobiles. Essentially, no one is out there assessing their safety. The European Union is doing something about the connection between disease and chemical exposure. Tell us about that. Increasing amounts of evidence suggest that many of the chemicals we encounter in our daily lives are responsible for whole array of health problems, like higher rates of cancer, higher endocrine troubles, higher infertility in young women, declining sperm counts in young men and birth defects. I write about what the European response was to this information, and I compared that to the U.S. response, and I'm afraid to report it's not a very happy picture. The E.U. is acting upon the evidence, whereas the U.S. has been doing essentially absolutely nothing. The Centers for Disease Control went out and tested Americans. What they found out is that all of us are walking around with 148 chemicals in our bloodstream right now. These are chemicals that we never asked to have in our bodies, but they're there. We're all walking around in this soup of chemicals. The E.U. took a look, and starting in 2005 banned all carcinogens, mutagens and reproductive toxins from use in cosmetics and hair dye. If you go to Europe and buy cosmetics, they don't have them in there. If you go to an American store to buy cosmetics, chances are those substances are still in them. In Europe, companies are finding alternatives to these substances. It's not like European women are running around not using cosmetics. Industry is coming up with alternatives left and right because there's a resurgence of research into green chemistry because of these initiatives. In 1981, you wrote in 'Circle of Poison' that U.S. corporations were selling pesticides that were banned here in developing nations. Are we now getting dumped on by E.U. companies? We wrote Circle of Poison about the moral hypocrisy of determining that chemicals that aren't good enough for Americans are OK to be dumped on other people. Well, now we're the ones in that situation. The E.U. is taking the lead on environmental protections and the U.S., for the first time in its history, is becoming a dumping ground for a lot of products that are banned elsewhere in the world. When I talk about what's at stake for American power, we're also talking about the economic power of the U.S., because as the Europeans move ahead with less toxic alternatives and more sustainable ways of production, U.S. industry is being left behind. You can see this in the dwindling market share of many American industries. What's the difference between E.U. and U.S. approaches to identifying and limiting risk from exposure to chemicals? Europeans operate according to the precautionary principle, which means if there's an accumulation of scientific evidence suggesting potential harm, the government is empowered to act. Compare that to the U.S. approach, which calls for a very high level of absolute, or irrefutable, scientific proof. If you talk to any scientist and tell them about this notion of absolute scientific proof, they'll tell you it's impossible to reach when it comes to chemicals. The U.S. also imposes very strict ideas of cost-benefit analysis before any regulation is put into place. So the costs to industry are set against the benefits to society. There's been a complete paralysis at the EPA because of these extremely strict rules and the EPA has not banned a chemical in at least 20 years. Any American probably thinks that asbestos is banned in the U.S. It's not. The EPA tried to ban asbestos back in 1990 and the industry came back with a lawsuit saying it didn't meet this strict requirement of scientific irrefutability and didn't meet the cost-benefit requirement so the ban was lifted. The EU's regulations have been in effect for a while now—are companies going broke complying with them? I investigated what happened when the companies began removing these substances, to find out the economic impact. Number one, they all went out and found alternatives. Two, the economic cataclysm that had been predicted both by European industry and American industry never happened. The loss of jobs never happened. You have European industries now producing products that have undergone a toxic screen and you've got American products that haven't undergone a toxic screen. If you're given a choice as to which one to buy you can weigh those products against one another and, increasingly, the Europeans are beating us. Many of our industries are now losing ground to European industry. Might Silicon Valley's high-tech companies bring our jobs back because there's less incentive for them to manufacture off-shore? They moved operations to countries with lax labor and environmental standards like Mexico and China, who've now banned chemicals that are legal here. You've got it exactly. The Europeans passed a whole array of laws that demanded that six toxic elements be removed from electronics. So what happened? The Chinese and everybody else who manufactures for the global market now produce according to the global standards set by the E.U. Which means two things: One, the U.S. regulatory authorities have become totally irrelevant to the production decisions of a major American industry—the high-tech industry. I've been down to meetings in Silicon Valley and I've sat in with engineers as they discussed and learned about these European laws. Now it's those European laws that they have to pay attention to. They aren't paying attention to the American laws, because the EPA isn't doing anything about this. Second, the companies that produce the no-name generic electronics from China wouldn't make it on the European market. They aren't interested in selling to the E.U. They want to sell to America and maybe Cameroon and Paraguay—places that have the minor environmental controls that we have. So for the first time in history, the U.S. is bundled into this assemblage of countries that have minimal environmental regulations. This is how we're becoming a dumping ground. What's been the reaction to 'Exposed'? Is anything changing? I've been invited to speak to state legislators in California, Washington and Minnesota. I testified in March at Vermont's Senate Health and Welfare Committee when they were considering their phthalate ban. Now some of the states are looking at that evidence and saying, "Hold on—we've got to do something about that." California and Vermont were the first to ban phthalates from children's toys. They'll take affect next year. Phthalates have been banned for almost 10 years in the E.U. States are desperate for some kind of leadership on the environmental challenges that we face, and they're not finding it in Washington, D.C.
State officials all across the country are flying not to Washington but to Brussels, which is the capital of the E.U., to get ideas on how to handle some of these things. Number one, you should be aware of this phenomenon and integrate this into your buying decisions. When it comes to electronics, there's a label on the back of them. If it has a "CE" on it that means it's been approved by the E.U. 's regulatory process. The sad fact is that if you're going to buy cosmetics, other than the small brand natural cosmetics, you're going to be a lot safer buying European ones. Of course you can make individual decisions, but there's no substitute for holding politicians' feet to the fire when it comes to demanding laws that require the removal of these kinds of substances, because in the end that's what's going to force industry to make these changes.